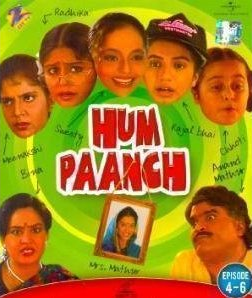 It is not possible to talk about quality Hindi SitComs without mentioning the name of – Hum Paanch. It became so popular in the days it was running, that a second season titled – Hum Paanch – Tadka Maar Ke! was also aired later. Though it was unable to be as popular as the previous series, it got moderate success! This was one of the sitcoms which is made for a complete family. Nowadays when we see that the difference between comedy, vulgarity and absurd stuff is getting thinner and thinner in terms of TV Shows; this serial sets an example that if content is great, it can produce genuine laugh, without crossing boundaries. The characters of the TV Serial became very popular those days and became the household names. And of course, the credit goes to quality writing, acting and the comic timing. A good news is, this TV Serial is now available (along with season 2) as a set of DVD for home entertainment. So, those who want to recall the old days can go through it. And, the new generation can get introduced to the same pretty well. The quality of DVD is also good. Of course, the video and audio quality may not be up-to-the-expectations, based on the technical limitations during the days it was shot. But, it is a complete family entertainer which you will enjoy watching for sure. Let us take a brief look at the first episode of the TV Serial, which also focuses on the Introduction of main characters. Anand Mathur is a middle class person who is having a very unique family! His wife is expired but lives as a photo in the hall of his home! She have something to say in each major stuff happening in the home. And yes, she also control Anand at a certain extent. With her Anand blessed with three girls named Meenakshi, Radhika and Sweety. Over the period of time Anand got married to Beena (aka Bina) and lives with her. He is blessed with two girls with Bina named Kajal and Chhoti. So it is the family of Anand and his two (yes, one lives in the photo frame!) wives and five girls. Bina is co-operative, loving and a typical middle class housewife. Though, the girls are having different personalities. They all five tends to create various situations for Anand (and eventually to family) which are troublesome, hilarious, funny,… altogether. Ashok Sharaf is a seasoned actor and have a great comic timing which is seen evidently in this episode. While Shoma Anand is good pair for him, Priya Tendulkar’s act is equally convincing. Bhairavi Raichura is perfect choice for the role of Kajal. Amita, Rakhi and Vandana plays their role convincingly. It is Priyanka Mehra who is not so convincing in the role she is playing. The dialogs are first rate and the screenplay is good. Sometimes the situations are not funny and actors try to create a laughter, but that is ok. The first episode of the serial is a good take off for the TV Serial and it is worth watching.